Please visit https://github.com/LifeIsOnTheWire/Post ... /README.md if you want to read more details on the Postage Board. I have tried to compile all the specs/details, and FAQs on that page. The postage boards are $20 USD + Shipping. I will send you a PayPal invoice via email after you complete the order form. You do not need a PayPal account to pay the invoice. Group Buy Opens today (July 28), and will remain open for 1 month (until August 28). During this time I will process these Google Form orders, and send PayPal invoices to your email provided in this form. You will have until the August 27 date to complete your payment. Order will be placed with my PCB manufacturer on August 29. The manufacturer aims for production to take only several days, so I anticipate receiving the completed batch within 2 weeks as a conservative estimate. 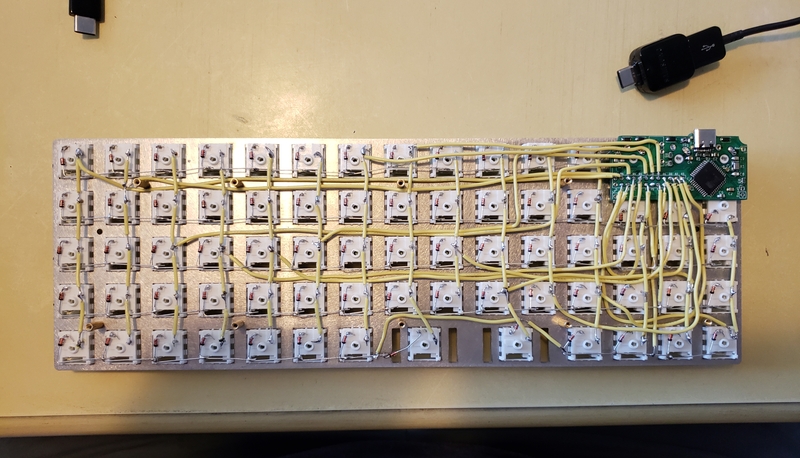 I plan on doing a quality test on a random selection of boards, in which I will do a quick multimeter test on a few spots , and load a test firmware, and use a copper wire to jump pins to test keystrokes. There will be no soldering done to test any boards. This process should take 1 or 2 days. 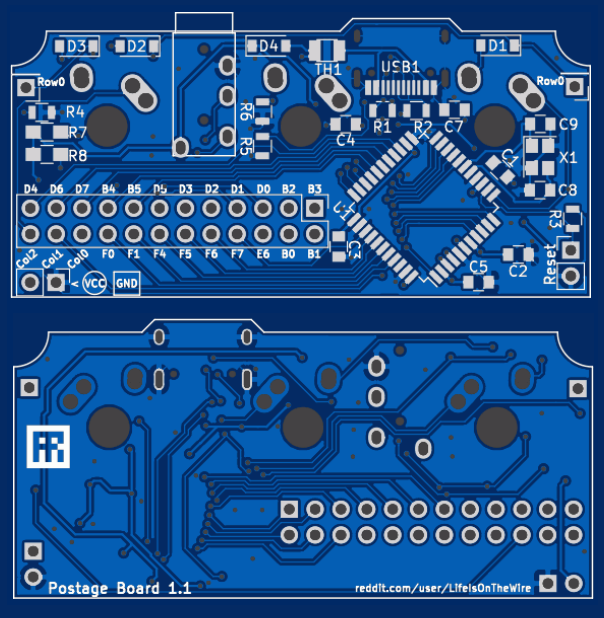 Barring any delays, I anticipate I should be able to ship the boards to you around September 15. If there are any delays, I will communicate them to everyone via email. I have a few contingency plans for dealing with any delays or issues. If there are any issues with the manufactured boards, I am fully planning on dealing with those issues before shipping to you. I also plan on ordering an additional stock of about 25% more boards to deal with any defects. I would definitely like to buy one, but quite frankly the shipping estimates are insane. is there any way to bring down the US shipping? Different carrier? slower service? mike52787 wrote: ↑ I would definitely like to buy one, but quite frankly the shipping estimates are insane. is there any way to bring down the US shipping? Different carrier? slower service? Perhaps I'll update the form to give people more options. $6 to UK, and $11 to EU. Both are non-tracked. If you prefer tracking, fill out the order form and I'll send you a quote. Any updates? I assume no news is good news? The order is submitted with the manufacturer, and I am awaiting a proper delivery estimate. The boards have been shipped from China and they are on their way to me. The next step will be for me to test a random sample of them, and then ship them out to everyone. The boards are in my possession, and I have completed the testing phase. They work splendidly, and I am working on shipping them out now. I ran into some delays with the shipping-out phase, my choice of packaging turned out to be incompatible with my shipper's labels. I have it sorted out, and they should all be shipped out tomorrow. Everyone who opted for tracking should have their tracking numbers now. Please reach out to me for any questions or issues. Got my tracking number. Thanks for the steady stream of updates! I don't suppose you had any extras of these that you will be selling? jacobavenkraft wrote: ↑ I don't suppose you had any extras of these that you will be selling? Keeb.io has them listed as coming soon- https://keeb.io/collections/frontpage/p ... handwiring thinking about picking one up for a rewire project. Yes, he should be selling them pretty soon. I will also be doing another GB soon too. LifeIsOnTheWire wrote: ↑ ... I will also be doing another GB soon too. I never received mine. How long does shipping to the EU usually take? RealityCavesIn wrote: ↑ I never received mine. How long does shipping to the EU usually take? Ah nice one, thanks! Swedish post service is a burning trash heap so I'll expect it to arrive in a couple of weeks. Nice to hear that they've started to arrive in Europe though. I would love something like this with built-in Bluetooth. Has anyone ever done a GB for something like that?